Proximity to everything . Wonderful experience . Would definitely recommend it to family and friends . 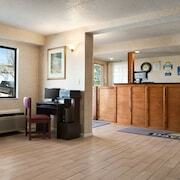 Where to find Monroeville hotels near an airport? 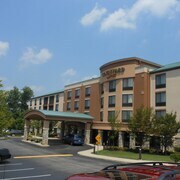 Where can I find hotels in Monroeville that are near tourist attractions? Organizing a trip to Pittsburgh and planning to stay in Monroeville? Expedia's network includes approximately 15 accommodations within a 0.1-kilometre (0.06-mile) radius of the town center. 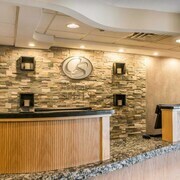 The Extended Stay America Pittsburgh - Monroeville is a much-loved accommodation choice because it is so close to Monroeville's center. The Extended Stay America Pittsburgh - Monroeville is positioned 0.3 kilometres (0.2 miles) away from the heart of Monroeville and is a sensible choice for visitors keen to save a few dollars. 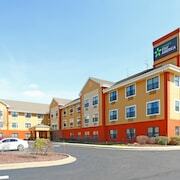 Visitors could also check out the rates at the Red Roof Inn PLUS+ Pittsburgh East - Monroeville. 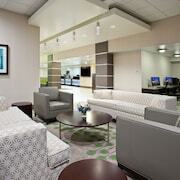 Check out the Fairmont Pittsburgh and also the Renaissance Pittsburgh Hotel. The Fairmont Pittsburgh is positioned 19 kilometres (12 miles) away from the center of Monroeville. The Renaissance Pittsburgh Hotel, is 19 kilometres (12 miles) away. Other options are the Residence Inn by Marriott Pittsburgh North Shore and the Courtyard by Marriott Pittsburgh Shadyside. Why not experience more of the rolling hills and tablelands that are commonly found in in Western Pennsylvania? Opt to spend a few extra nights in other parts of Western Pennsylvania. Spend your time hiking or make a trip to the region's attractions. Suitable hotel options are available. Looking for more things to do? Consider spending a day or two discovering Washington and Jefferson College and Tanger Outlet Center, which you'll find in Washington, 50 kilometres (32 miles) to the southwest of Monroeville. If you'd like to spend a night or two in Washington, check Expedia's booking pages for the latest deals at the The George Washington Hotel and SpringHill Suites by Marriott Pittsburgh Washington. 19 kilometres (12 miles) to the west of Monroeville, you'll also find Downtown Pittsburgh, which is home to the Springhill Suites by Marriott Pittsburgh North Shore and The Westin Convention Center, Pittsburgh. The Fort Pitt Museum and U.S. Steel Tower are a couple of the most popular points of interest to see when visiting Downtown Pittsburgh. For those travelers planning on arriving or departing through Pittsburgh International Airport, you may choose to book a room at Hyatt Regency Pittsburgh International Airport, or Hampton Inn Pittsburgh Airport, which are both a short drive away. What are the most popular Monroeville hotels? Are there hotels in other cities near Monroeville? What other types of accommodations are available in Monroeville? 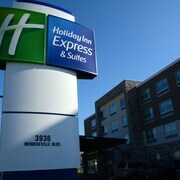 Explore Monroeville with Expedia.ca’s Travel Guides to find the best flights, cars, holiday packages and more!